Crimson Pitcher Sage is a rather striking plant which blooms from March to June. Whorled clusters of bright, hot-pink to ruby-red flowers form at widely spaced intervals along a stout stem. 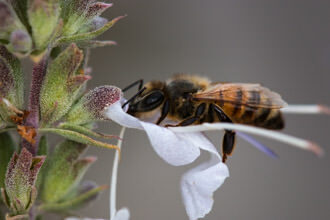 Each individual flower in a cluster is two-lipped and about an inch or more in diameter, with stamens extending further. The bracts surrounding the red flowers are maroon or purple in color, such that when the flowers are spent, the plant is still colorful and pleasing to look at. 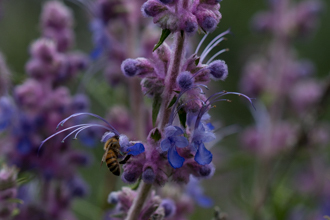 As one of its common names implies, a large amount of nectar is contained within the flowers, making them very attractive to hummingbirds. 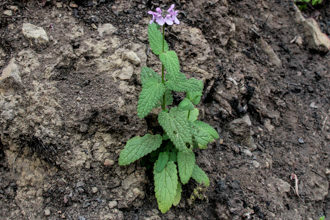 Leaves appear mostly at the plant's base, each from 3 to 8 inches long. 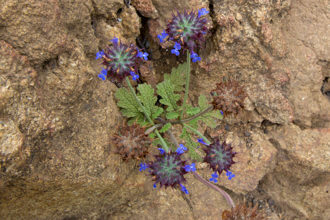 They are arrowhead-shaped with toothed edges, deeply textured and dark green on top, pale and hairy underneath. 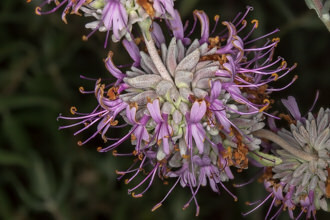 Other parts of the plant share this bristly appearance. 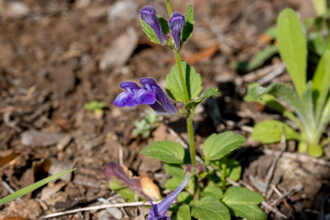 Like other sages, the plant has a pleasant, faintly resinous odor. The primary method of propagation is by underground rhizomes. 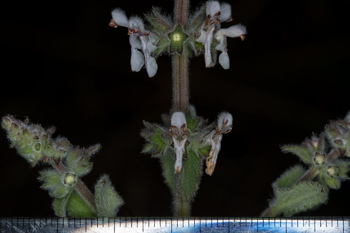 Hummingbird Sage is popular with gardeners, for reasons that should be evident from this paragraph if not from the photos. 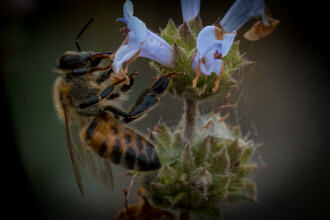 The genus name Salvia has Latin origins, probably meaning wellness or healing. Spathacea comes from the word "spathe", a term for the surrounding flower bracts found on this plant. 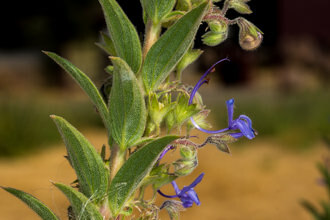 Some will refer to Salvia spathacea simply as "Pitcher Sage", which can be confusing because there is another plant in the same Mint family that shares this particular common name (Lepechinia fragrans). 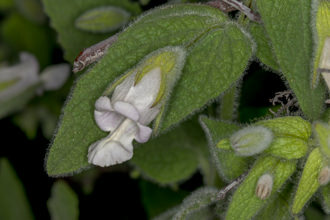 Appearances differ however, as this other plant is a shrub with white blossoms and a very strong vinegary odor. Last modified: May 12 2017 16:40:57.